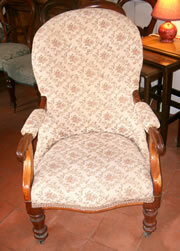 A Victorian buttoned tub chair with walnut turned legs, this chair is a little wider than most chairs of this design. 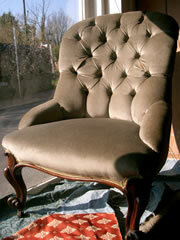 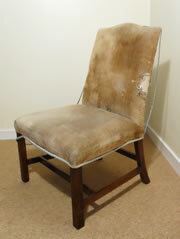 It requires upholstery we can arrange this or sell it as seen for £150. 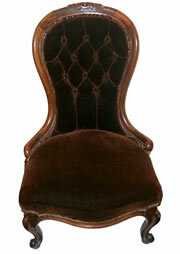 A very nice Victorian buttoned back chair with mahogany cabriole legs covered in cream velvet all in excellent condition. 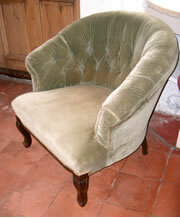 A very good Victorian buttoned back chair with mahogany cabriole legs covered in pale green velvet.This chair is in excellent condition. 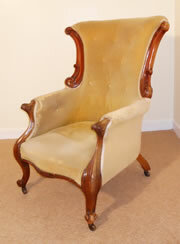 We have for sale a stunning Victorian button back armchair. 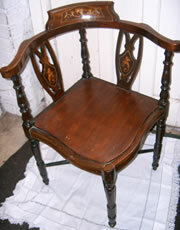 This chair is in dark mahogany with some very attractive carving and the wood is in good condition. 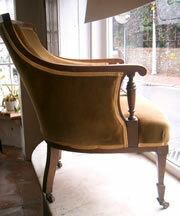 It is heavy and solid, and of a very high quality.�It has been upholstered in a gold velour which now shows signs of wear and tear and would benefit from being reupholstered. 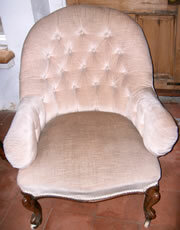 It is sprung and is stuffed with horse hair, it is a very comforatble spacious chair.